Out on a limb, it’s never easy. Your nails are sharp, my hearts is bleeding. 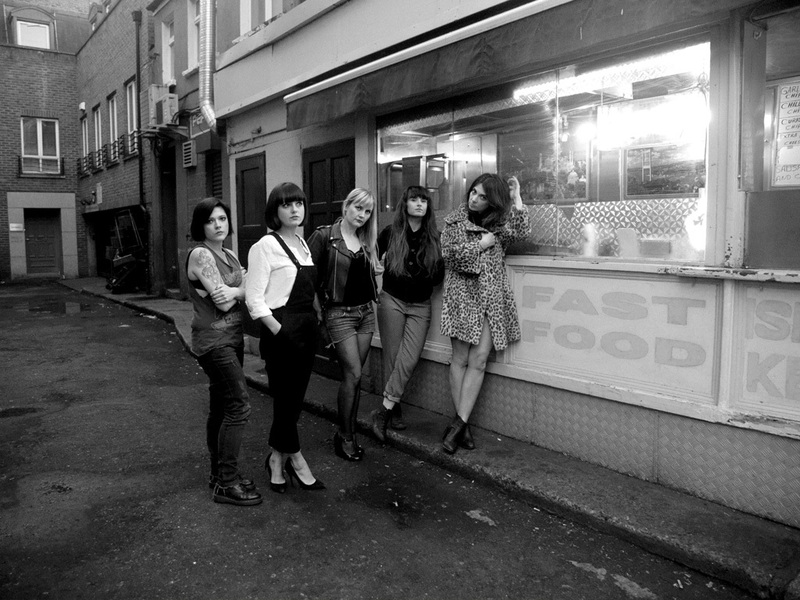 2014 shaped up to be a year of triumph for Dublin-based noise pop quintet September Girls. Starting off the year incredibly strong, they signed to UK based Fortuna Pop! in January to release their first full length album Cursing the Sea. Filled with driving drums, doom-filled fuzz guitars and perfect monochrome vocal harmonies, the album delivered on all the hype from their well-received late 2013 single, “Heartbeats”. After the album's release, September Girls began enjoying a newfound recognition and popularity in the UK. The band's signing to Brooklyn-based label Kanine Records will undoubtedly grant September Girls the opportunity to further expose American listeners to their brand of dark-hearted rock. Drawing inspiration from the likes of Phil Spector, The Velvet Underground, The Cure, My Bloody Valentine and The Jesus And Mary Chain, the five-piece play reverb-soaked noise-pop of the finest order, with distant layered harmonies, swirling organ and distorted guitar described by Nylon as “dark, moody and pretty damn cool.” Cursing the Sea garnered widespread coverage, with a Guardian New Band of the Day piece, NME radar and 8/10 review and a 4-star review in The Fly as well as coverage in The Sunday Times, The Observer and Uncut. The Financial Times said that they were “like a less malevolent Jesus and Mary Chain – impressive power, conjuring exactly the right balance between noise and sweetness” while Time Magazine called them the newest addition to Dublin’s rich musical history. In the intervening months September Girls has been busy on the road, playing SXSW as well as UK festivals such as Beacons, Body & Soul, Great Escape, Stag and Dagger and Wales Goes Pop, not to mention a mobbed show to a packed Berwick Street for Record Store Day. Bobby Gillespie and Andy Weatherall turned up for their show at The Lexington in London and they were invited to support John Spencer Blues Explosion in Dublin. They are set to play at The Liverpool Psych Fest later this month and CMJ in New York in October. As their year of triumph drew to a close, September Girls returned with a brand new four track EP entitled Veneer, recorded deep underground in Guerilla Studios, Dublin. Whilst still retaining their signature drenched feedback sound, the tracks have a greater depth and polish than the album recordings. Each of the four tracks is written and sung by a different member of the band, who describe their songs individually below: Veneer – Veneer was written to stand up to the force that stifles creativity and expression. Like a critical voice in your head that tells you you're not good enough, it leaves you feeling empty and useless. "Seductive veneer" refers to the easy option, which is quitting. I think the message of the song is to ignore that voice and do it anyway - Caoimhe Black Oil – Sarah and I started jamming out the music one day in the studio. The imagery in the lyrics came from a couple of places, the first being a dream I had, the second being some crazy stuff I had written down on Christmas night last after a few drinks. The meaning of the lyrics "if I could swim, I'd be dead by now" is about acceptance of ones own limitations and the realisation that perhaps sometimes your perceived shortcomings can be the thing that saves you - Paula. Melatonin - There are many things that can keep you up at night; Melatonin is a lullaby to oneself to try to keep sane when plagued with insomnia - Jessie Butterflies - About navigating life after heartbreak, negotiating the balance between heart and head, abandon and protection – Lauren The perfect way to round off September Girls' incredible year, the Veneer EP builds on the foundations of Cursing The Sea to offer a tantalising glimpse into the band's future as purveyors of the finest dark-hearted pop.